The First Day of Spring has officially passed, and it’s an exciting time here in Napa Valley. Bud break is just around the corner for the Leonardini Family vineyards, and we are equipped to protect the vines for late season frost. While we shake off winter, cold weather can still creep in and have damaging effects on the vines just beginning to awake. During the winter months, grapevines develop the ability to tolerate freezing temps and enter a state of dormancy. In the spring, the vines start to wake up in preparation for bud break leaving them vulnerable to frost. When plant tissue temps fall below freezing in the spring, sensitive perennial crops can suffer irreversible cold injury. Here are three ways that we prevent frost at the Leonardini family’s vineyards. 1) Natural Elevation: Some of our vineyards have natural elevation on their side. Sloping protects our vines because cooler air settles at the bottom away from the vines. 2) Wind Machines: Wind machines use inversion layers to protect plants from frost. 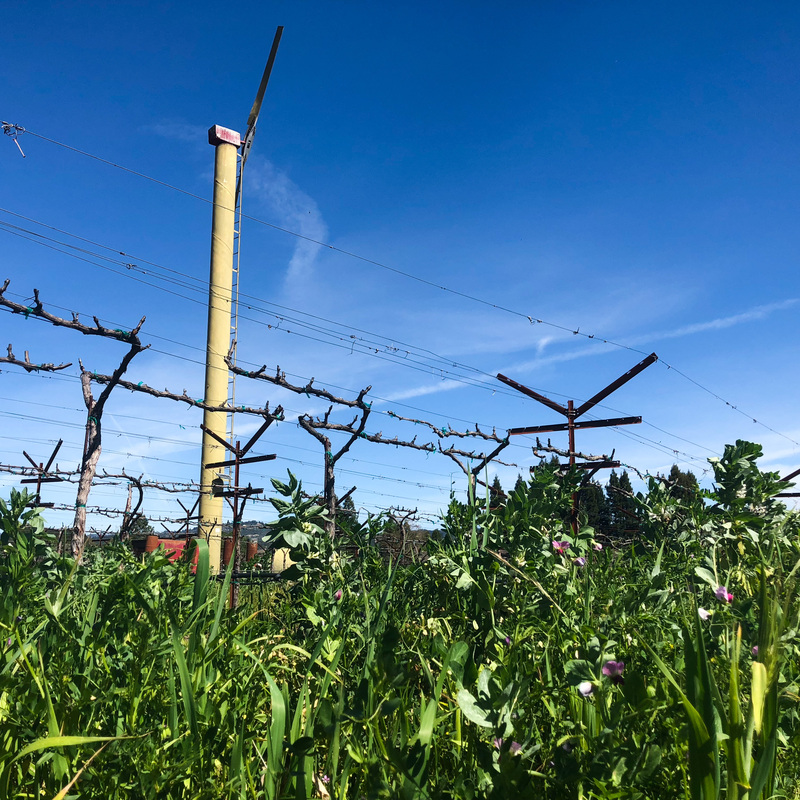 By drawing down warm air 30-40 feet up and mixing it with the cold air settling near the ground, wind machines can raise the air temperature surrounding the vines. Most wind machines run when temperatures drop between midnight and dawn, and a single wind machine can protect 10-12 acres of grapes. 3) Overhead Sprinkler System: While counterintuitive, ice can be very effective protection against frost. The objective is to maintain a safe temperature of 32 degrees Fahrenheit at the surface of the plant. The sprinklers apply and maintain a thin film of ice. Water has to be constantly applied to keep the ice at 31-32 degrees Fahrenheit, which keeps the buds underneath at 32 degrees Fahrenheit through heat fusion. When water is applied to the ice, a small amount of heat energy is released as the water freezes. The energy required to turn liquid into a solid–water into ice—is called heat fusion. While cool air and temperatures can’t be controlled, grape growers have a few options to protect their vines from frost. Bud break is just around the corner, and we are looking forward to the warmer weather ahead. Hello Spring!